It may not be the Champs Elysées, but Parc Jean-Drapeau in Montreal was swarming with red, white and blue Sunday afternoon as France poured in the goals and, finally, won the World Cup 4-2. 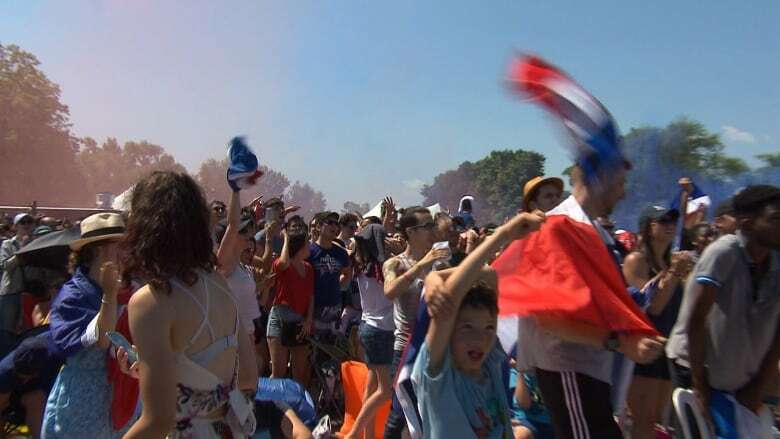 It may not be the Champs Elysées, but Parc Jean-Drapeau in Montreal was swarming with blue, white and red Sunday afternoon as France poured in the goals and, finally, won the World Cup 4-2. The France-Croatia game was played on giant screens at the park on Notre Dame Island, where the popular music festival Osheaga is held. Organizers of the World Cup final viewing party said they'd counted more than 10,000 people there to watch. The French flag was painted on people's cheeks and arms, and hundreds waved it in the air and honked horns at good plays. 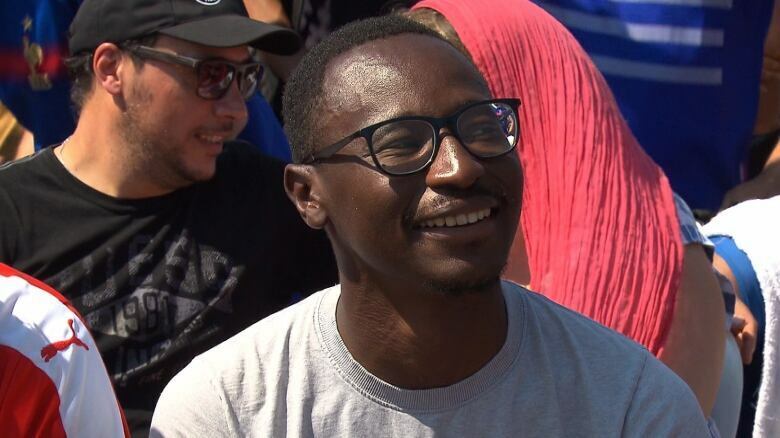 Ibrahima Kaba, who originally hails from Guinea before moving to France and then Montreal, arrived at 9 a.m. with a group of friends to scope out a good spot. "It's better to watch in this ambiance, as you can see," Kaba said as fans chanted and cheered at a goal that had just been scored. Montreal has seen an influx of French immigration in recent years, with 57,000 French nationals now living in the city. Kaba's friend, Audrey Cuzou, said it was special for her to watch among their community. "We live in Canada now and it's important to support France, especially when you are not at home," Cuzou said. "It's a great moment." Jean-Drapeau wasn't the only gathering place for fans in the city, though. 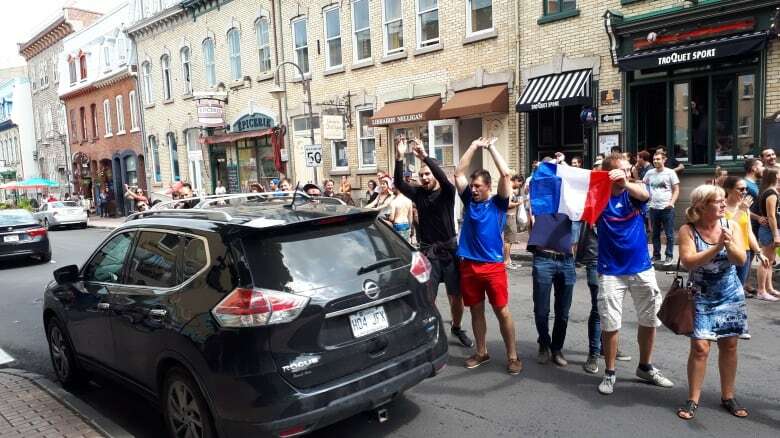 A two-storey tall French flag covered the front of bar l'Barouf in the Plateau-Mont-Royal neighbourhood, where rapt fans waved flags, honked horns and cheered on their team with calls of "Allez Les Bleus." After the game, they poured onto the road, blocking the major intersection of St-Denis and Rachel streets. Fans also crowded streets in the provincial capital, Quebec City, a popular destination for French tourists. Back at Jean-Drapeau, Jerome Maurice said he was reliving the last time France won the World Cup, 20 years ago. Maurice had just moved to Montreal then. 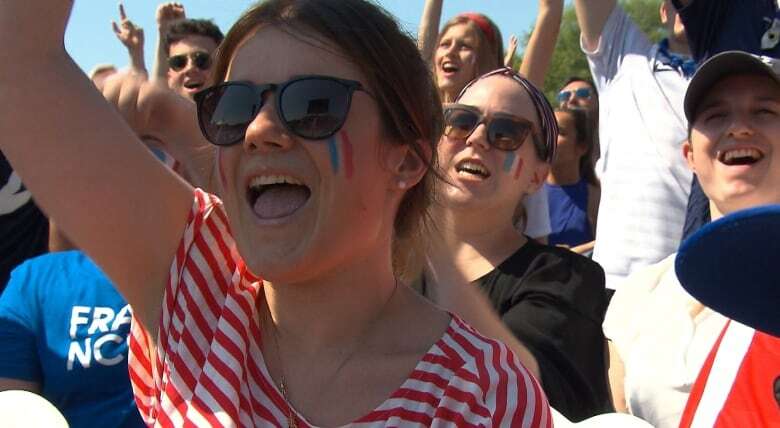 "It was crazy, but this year it's going to be even more," said Maurice, who'd wrapped his shirt over his head to protect it from the sun barrelling down on the crowd, as the score for France was 3-1. Several French tourists took time out of their trip to Canada to watch, too. Caroline Hachard was visiting Montreal with her family and said there was no way they'd miss it. "I feel so good! We are French and on vacation here and it was important for us to be there today, and we are the winners, so it's amazing," Hachard said. "It's a good, good day."